Time for the third review of June, halfway through the month. No worries, however, as I have many more planned for the first month of summer. Today we are turning our attention towards Monster Tale, a game not spoken of much by the mainstream. Does Monster Tale deserve some more attention? Read this review to find out. 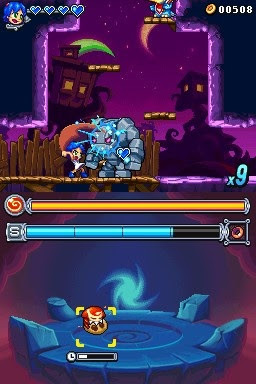 DreamRift is setting themselves up to be the 2D platformer extraordinaire when it comes to Nintendo handhelds. Their first project, Henry Hatsworth in the Puzzling Adventure was well received (though many claimed it was mightily hard), and their next project is a "dream" come true for them, working on Disney Epic Mickey: Power of Illusion for the Nintendo 3DS. In between both projects, however, is a rarely trumpeted title with loads of charm, Monster Tale. 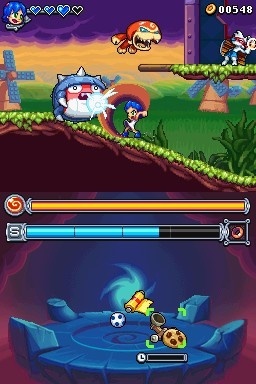 It is a Metroid-style game in one part and a pet-raising simulator in the other part. Do both parts equal a lovely bedtime story? Monster Tale tells the... well, tale of a young schoolgirl named Ellie. It seems fate has a destiny with her name on it as she awakens from her nighttime slumber and heads to the nearby forest. There she stumbles upon a large band, which she wraps around her wrist. Suddenly, she is transported into a world of monsters where she meets a hatched from an egg creature. The monster grows quite fond of Ellie immediately, so she allows it to follow her, naming it Chomp. Little do the two know what evils in the background are occurring. Between several kids wanting to use monsters to take over the real world to getting back to Ellie's own world, the team of Ellie and Chomp have plenty on things to do on their proverbial plates. 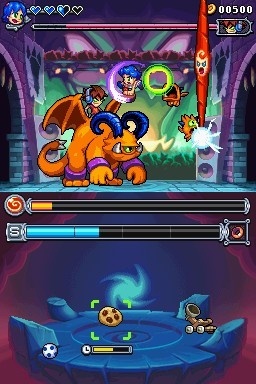 Monster Tale's gameplay foundation makes it very much inspired by games like Metroid and later Castlevania games, but while the top screen is relegated to the action adventure mayhem of the game, the bottom screen is devoted to Chomp's nesting area. 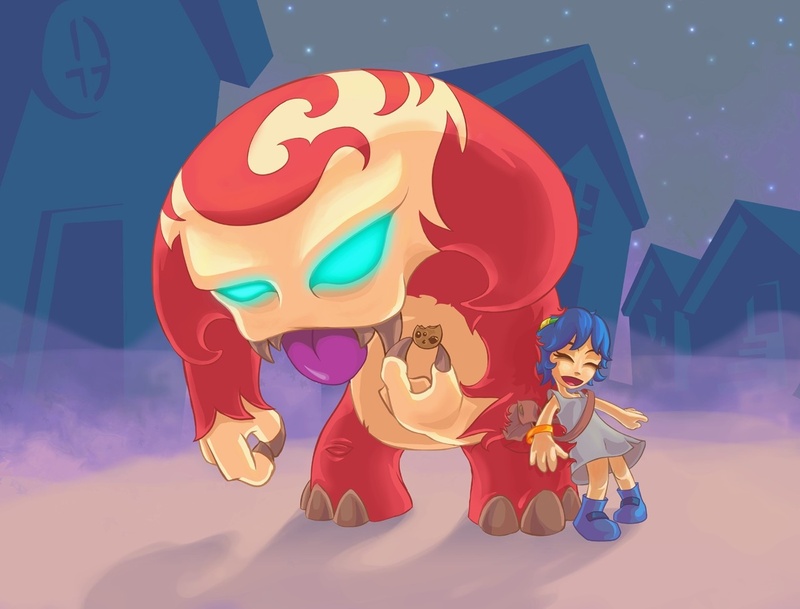 By having Ellie collect items such as food and accessories dropped by defeated enemies or found in different areas, Chomp goes to town on them, gaining him valuable experience points. Once enough experience has been gained, he will grow a level. Though, I do wish the game wouldn't interrupt you and pause the game every time Chomp grows. It seemingly never forgets to manage to stop you dead in your tracks at precarious positions, such as being in the middle of a battle with various dangerous foes. Ellie and Chomp, a match made in heaven. 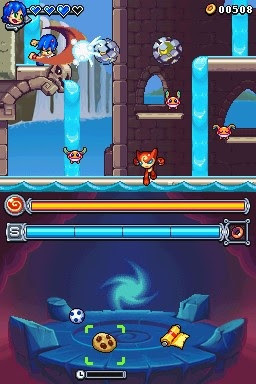 Chomp can earn new abilities from gaining levels. These can be mapped to the L and R buttons. While one move slams Chomp into a foe, another can turn the creature into an anvil to be dropped onto baddies. When Chomp reaches certain level requirements, he can branch off and evolve into different forms. Each form learns its own individual moves, gains its own stats such as stamina, defense, intelligence, and agility, and helps Ellie out in numerous ways. There are 30 or so particular forms for Chomp to take on, and mastering all of them will take a lot of time to do (it's quite the grind to say the least). Like Chomp, Ellie can learn a lot of special moves via unique statues strewn about the various lands in the game. She almost resembles a female Mega Man X as she gains the abilities to jump up walls (as well as slide down them) and charge her Band Blaster a la X's X buster. But that the limit to Ellie's learned abilities. She can be educated as to acquire information on how to melee attack, leading to learning a devastating five hit melee combo, smash downward from the air, dash, be immune to poisonous air, and even fire off a chain of Band Blasts. call in Chomp as an equalizer. With a typical Metroid-style game, you learn new abilities to enter previously impossible to enter areas. This holds true with Monster Tale, but it's just that Metroid does it better. With Monster Tale, it seems like you are constantly being told to backtrack through huge portions of the world map just to reach this one room you couldn't access before. Then the process happens again. The amount of annoying backtracking in Monster Tale is insane, and it's poor planning or artificially extending the playing time that is the culprit here. Thankfully, the game has a helpful map that always highlights the area and room you need to reach next. Chomp isn't just entrusted to the bottom screen either. At any time with the X button he can be summoned to the top screen to dish out damage to delinquent enemies as well as hit switches that are on the top screen (there are also times where Chomp will need to help Ellie out by hitting switches on the bottom screen). As long as the Pet Meter has some iota of health in it, Chomp can stay on the top screen. The Pet Meter slowly drains as Chomp on Ellie's screen, and goes down faster if Chomp is hurt by a foe, but it recharges while he's on the bottom screen. the Pet Meter will slowly recharge. 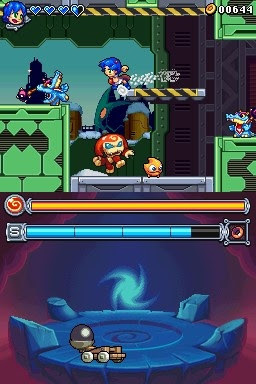 In some instances, like the boss fights, you must keep watching both the top and bottom screen as battles encompass both. Perhaps a boss drops a nasty surprise on the bottom screen that Chomp must destroy before it causes trouble for Ellie on the top screen, or perhaps one of the dragon heads of a boss lowers itself to the bottom screen where only Chomp can go to town on it. There are some very creative uses of both screens of the Nintendo DS on display here. spirited parts of Monster Tale. Aside from items for Chomp to eat or play with, enemies also drop money when they are defeated-- Money in the form of coins, jewels, and pearls. These can be used at a certain helpful monster's shop for upgrades for Ellie such as more health, less energy consumption, and more powerful melee and/or Band Buster attacks. There are also upgrades for Ellie's health as well as extra slots for Chomp (for boosts to attack, agility, elemental damage, etc.) placed in out-of-the-way locations for Ellie to nab. Acquiring a 100% completion rate requires the player to purchase all of the items in the store (there's multiple locations set everywhere) as well as level up all of Chomp's forms. Considering how time-consuming and mind-numbing this is as well as how lame the actual 100% completion rate prize is (it's a quick ending picture), most players will just be content with beating the game, which will take anywhere between 5-7 hours. Those who were put off by Henry Hatsworth's difficulty should find Monster Tale to be a welcomed change of pace challenge-wise. The game is relatively on the easy side save for some rough spots near the end. but there is an "I" in pain. Monster Tale is full of vivid and vibrant color in the environments, backgrounds, enemy design, and character models. Everything looks and feels incredibly smooth and pleasant. What I like most about the environment design is the plethora of types there are-- autumn forests, ruins, aqueducts, factories, monster nightclubs (yes, monster nightclubs), icy wastelands, haunted areas, and regal castles. The music is without a doubt catchy as well, with plenty of pieces that will get engraved into your mind-- partly because you'll be revisiting areas so darned often. There's even a modest sampling of voice work. Most dialogue is text, but some are accompanied by off-hand one-liners. 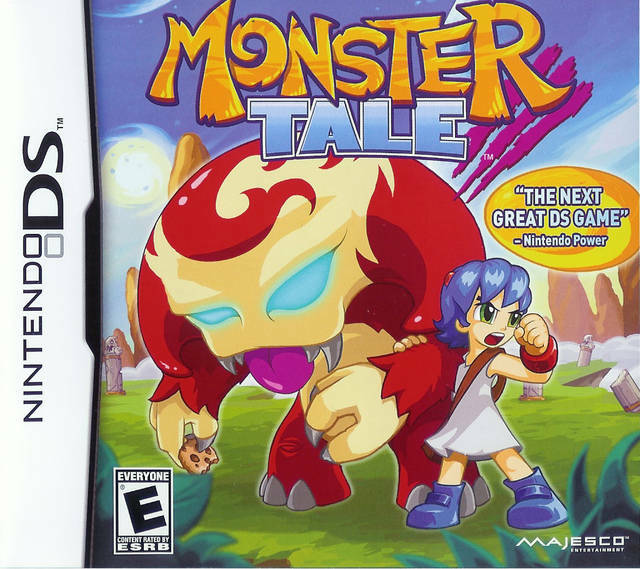 Monster Tale ends up being a respectable game in the vein of Metroid, but it ultimately falls somewhat short. The overwhelming amount of backtracking back and forth between areas is a tad too much, and the monster-raising mechanics could go into a little more depth and be less of a grinding experience. Other than that, Monster Tale comes off as a highly overlooked and under-appreciated gem in the cavalcade of 3DS titles that fell through the cracks and went under a lot of people's radars. For something with high amounts of allure in both gameplay and presentation, Monster Tale might be worth a read... er... play.